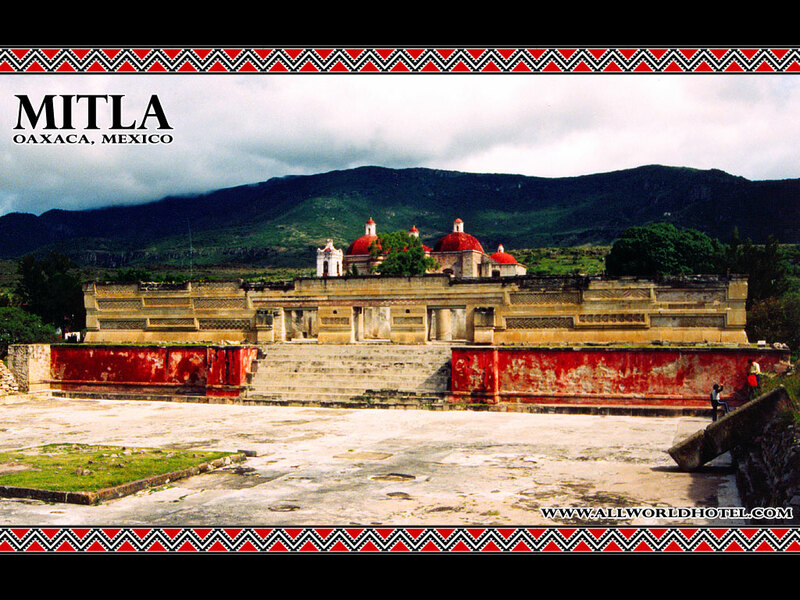 The Name Mitla is derived from the Nahuatl word "Mictlan", which means "Place of the Dead". In the Language of the Zapotecans, it is called "Lyobaa", which means "Burial Place". The name in the language of the original builders (The Zapotecans) is probably the most accurate when one considers the tombs of the ancient kings and priests which are actually an integral part of the structures within the city. Archaeological evidence indicates that the site was actually inhabited as early as 900 BC, but the structural remains of the city itself have dates ranging between 200 AD and 900 AD. The Structural remains of the city correspond with the height of Zapotecan rule over the region from Monte Alban (500 BC to 800 AD). It must be noted, however, that Mitla experienced its greatest growth between 750 AD and 1521 AD; and this period of growth corresponds with the end of Zapotecan rule over the area and the beginning of Mixtec rule with its center of power based in Mitla. 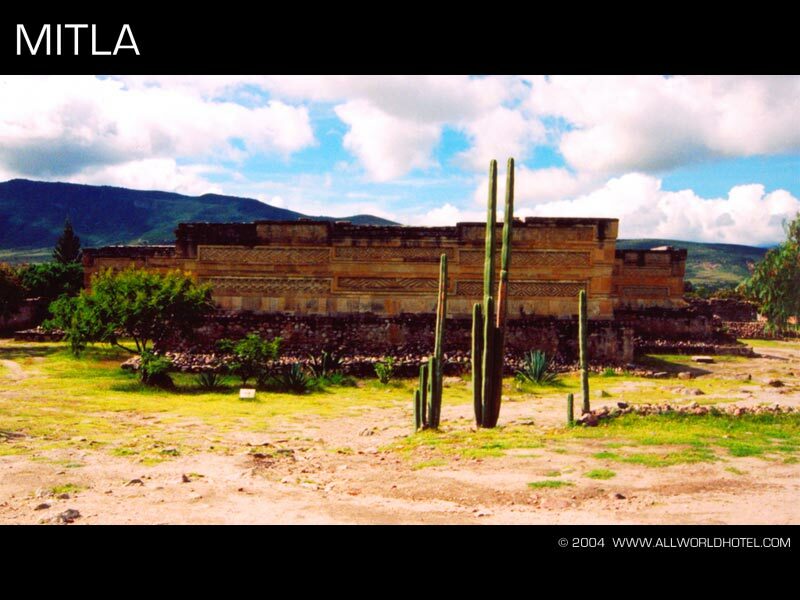 Political Power in Mitla followed the same theocratic structure as Monte Alban. In 1580, an early Spanish explorer named Canseco visited Monte Alban and said that the interior chamber of the Hall of Columns was the residence of the High Priest who was "like our Pope". And the Spanish Chronicler, Father Burgoa, said that Mitla was once the residence of the Zapotec High Priest who was so powerful that the King Zaashila bowed to his wishes and commands. He went on to say that the High Priest ruled from his Jaguar covered throne - even the King, when in his presence, took a lower seat. The ancient city of Mitla was made up of 5 main palaces, or precincts: One for the Zapotecan High Priest, One for secondary priests, one for military officers, with one reserved for the king and another for his entourage (when they were in town). 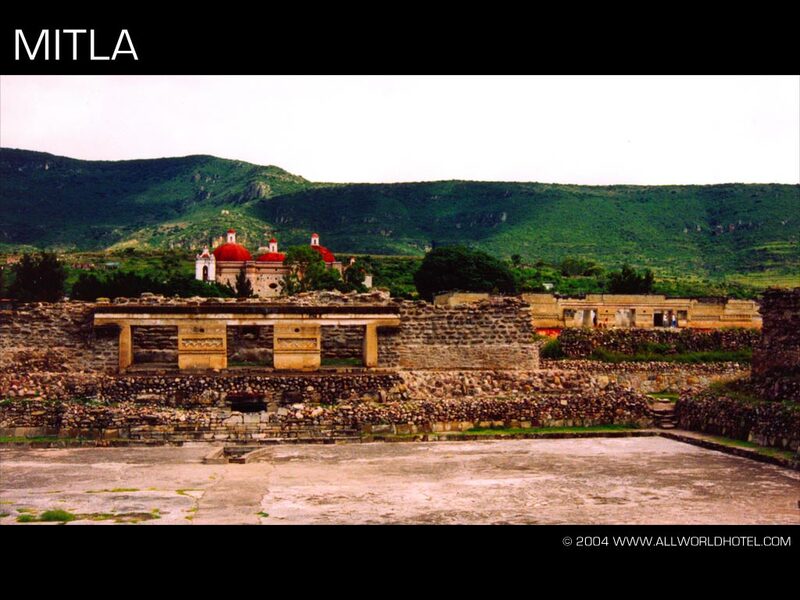 Today, what is left of Mitla, gives us a glimpse back into the past. To a time when the walls with long panels of geometric mosaics made of polished stone and pieced together without mortar stood out against a brilliant red background. A time when the codex style writing which covered the walls of the palaces were bright and new. When priests were trained here, and the noble dead were laid to rest. Busses leave for Mitla every half hour from the second class bus station, and a ticket will cost 12 Pesos (you pay another 12 Pesos on your way back). 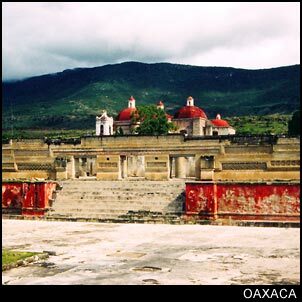 The ruins are located about 45km from Oaxaca, and the trip will take about 50 minutes. When the bus stops in Mitla, signs will point you towards the ruins and it’s a ten minute walk to get there. The ruins are open Tuesday through Sunday from 9-5. Entrance to the ruins is 30 Pesos (free on Sundays for Mexican Nationals only). If you have a video camera, it will cost you an extra 30 Pesos (tripods are by special permit only). If you would like a first class tour of the ruins, guides are available for 120 Pesos.